Shinto : Jyosaku ranking : Inaba province : Wazamono cutting test ranking. Blade length : 51.52 cm or 20.28 inches. Sori : 1.35 cm or 0.53 inches. Shape : The blade is wide(3,18cm) and thick healthy blade. Jitetsu : Koitame had well grained with jinie attach beautiful texture. Hamon : Konie deki gunome midair and cyoji midair mixed with thick nioikuchi. In Hamon, sunagashi and kinsuji work. 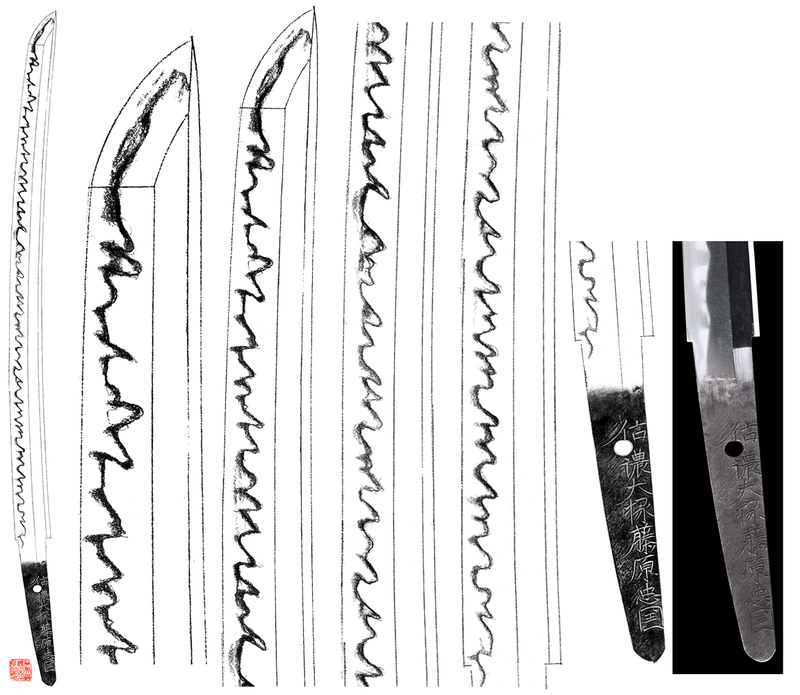 Special feature : Shinano Daijyo Fujiwara Tadakuni was called Yamamoto Hachidaiyu and a student of the Dewa Daijyo Kunimichi and helped him for making swords. Kanei era, he moved to Inshu province and changed his name to Tadakuni and after that Kanei 11th August, he got the title of Sinano daijyo. He passed away Kanbun 6. At early Edo period, Daimyo Harunobu Arima governed Amakusa but he tried to severe tax was collected. Farmers and some high ranking samurai Amakusa shiro fought against Daimyo but defeated by the Shogunate army. Shimabara seigneur Katsuie Matsukura who collected a severe tax against farmers and religious for christ was beheading for the Shogunate. But by this event, Tokugawa shogun decided to broke off diplomatic relations with Portugal because the reason this issue was made by christianity. Tsuba : On the Sea cucumber shape, gold Nunome zogan(inlay) was done. Fuchikashira : On the syakudio nanako plate, dragon and cloud are engraved with gold color. 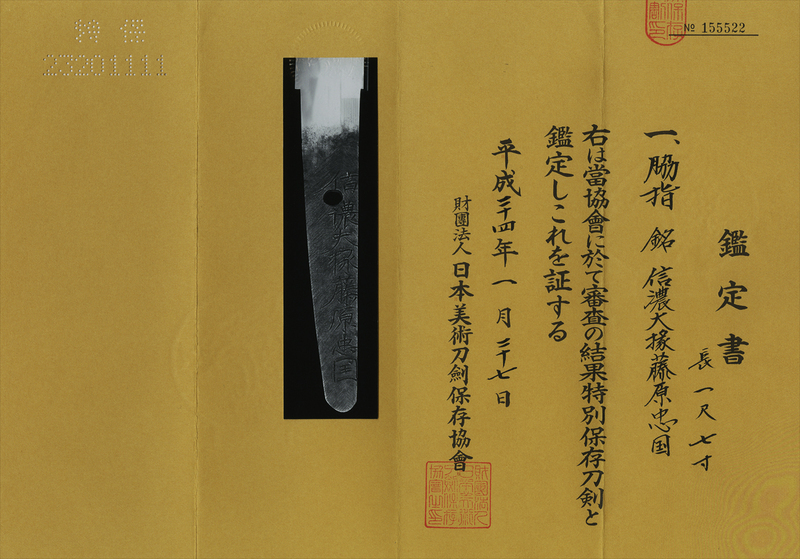 Kozuka : On the syakudo nanako plate, autumn plants are engraved with gold color. 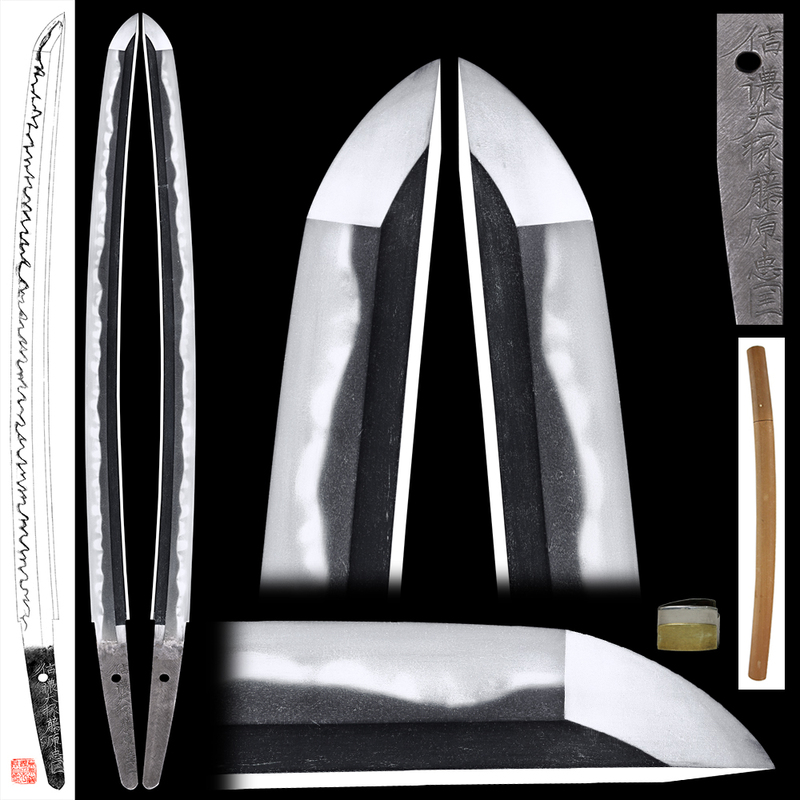 Wakizashi : Hoki no kami Fujiwara Nobutaka Discounted!! !